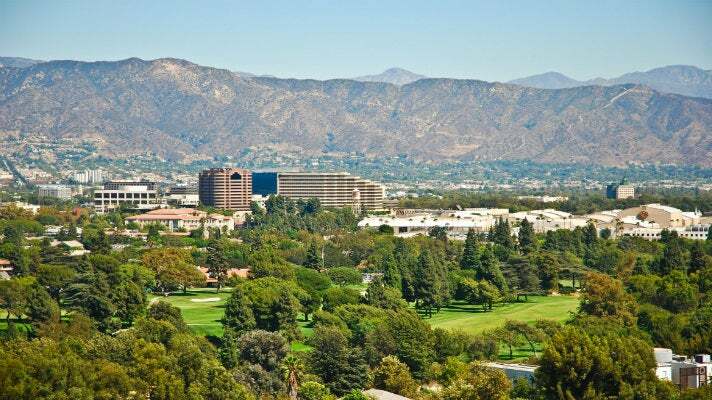 As home to the world’s major movie studios, the San Fernando Valley is where celebrities live, work and play. Here’s a 24-hour, behind-the-scenes itinerary of the Valley’s sizzling attractions, restaurants and nightspots. Have breakfast at Jerry's Famous Deli on Ventura Boulevard. It's the flagship location and a celebrity favorite. Throughout his professional career, Andy Kaufman kept a day job here bussing tables (as seen in the movie Man on the Moon). Shop to your heart’s content. Stretching from Universal City to Studio City to Sherman Oaks, Ventura Boulevard is boutique shopping at its best, with pockets of concentrated stores that thrill visitors in search of off-the-beaten-path finds. Be sure to check out Mimi & Hy and Stacey Todd, among the dozens of stores that line both sides of the street. A complete entertainment experience waits at the Glendale Galleria. Anchored by Nordstrom and Macy’s, the mall features top name boutiques, spas, salons, a children’s play area and a food court. Westfield Topanga mall in Canoga Park gleams with three-story atriums, elaborate water features and six different precincts, each with its own distinct feel and retail focus. Need more? The mall also boasts a 120,000-square-foot Neiman Marcus. For even more shopping adventures, visit Universal CityWalk Hollywood, the $400 million shopping center Americana at Brand, the Sherman Oaks Galleria and Westfield Fashion Square (with Bloomingdale’s) in Sherman Oaks. Have lunch at one of the stylish eateries along Ventura Boulevard. Universal CityWalk Hollywood also has a host of dining options. The choices are endless! In the mood for South of the Border fare? Enjoy Mexican food and margaritas at the longstanding Camacho's Cantina. And the menu is as lively as the crowd at Bubba Gump Shrimp Co. Restaurant & Market in Universal CityWalk. Visit Universal Studios Hollywood and experience Transformers™: The Ride-3D, an immersive, next generation thrill ride that blurs the line between fiction and reality. Fusing HD 3D media and flight simulation technology, this epic ride creates an experience unlike anything this planet has ever seen. There's also the mega-thrilltacular, The Simpsons Ride, based on the critically acclaimed TV series and movie. You’ll rocket through “Krustyland,” a new fantasy theme park created by the show’s cantankerous Krusty the Clown, and be fully immersed with Homer, Marge, Bart, Lisa and Maggie Simpson on “Krusty’s Thrilltacular Roller Coaster” as you rip at faster-than-lightning-speeds on a hysterical, almost unimaginable adventure. After enjoying Universal Studios Hollywood’s multitude of rides and attractions, walk over to Universal CityWalk Hollywood and experience the thrill of skydiving — without the plane. The iFLY Indoor Skydiving experience is like no other, and you might just share the experience with a movie star. Robert Downey Jr. once did the iFLY skydive while being interviewed for a GQ article. Or take the Warner Bros. Studios VIP Tours, where you might see film or television productions in progress. As the sun goes down, dining in the Valley truly shines. Zagat has named Leila’s (American dishes with Asian accents) and Saddle Peak Lodge (game-centric, New American cuisine) among the top food picks in Los Angeles. Ventura Boulevard is nicknamed “sushi row” for its noteworthy Japanese restaurants. Try Katsu-ya, a favorite with the entertainment industry. The upscale Italian cuisine at Panzanella draws a chic crowd, and film industry heavyweights frequent Black Market Liquor Bar for its seasonal small plates and stellar cocktails. Now it’s time for entertainment. Head to NoHo — that’s local-speak for North Hollywood — and its cornucopia of live theaters featuring performances from the classics to improv and everything in between. Among the favorites is El Portal Theatre, which was built in 1926 as a Vaudeville theatre. For live theatre that pushes the envelope, grab a ticket to Zombie Joe’s Underground Theatre. Don’t be surprised if you see celebrities in the audience. And remember, here in LA, the “unknowns” you’re seeing on stage tonight are the stars of tomorrow. Located walking distance from each other in Studio City, the always-hopping gastropub Laurel Tavern is popular among big groups out for a good time, while Page 71 has more of a slick ultra-lounge vibe. Also, be sure to drop by Universal CityWalk Hollywood and pick your hot spots including Howl at the Moon, with its outrageous dueling piano bar; Infusion Lounge dance club; and the iconic Hard Rock Café. Iconic diner Bob's Big Boy in Burbank is open 24 hours. Built in 1949, this landmark eatery's Googie architecture hasn't changed since the days when Bob, Hope, Debbie Reynolds and Mickey Rooney were regulars. Get up and do it all again — but this time in one of LA’s other breathtaking regions.